Reasonably priced compared to other log splitters in its class, this 6-ton splitter from WEN is arguably the best electric log splitter for the money. Stocked with a 2 horsepower motor, it does a decent job of splitting small and medium sized logs. Made out of tough steel, and equipped with two treaded wheels, it is equal parts durable and portable. A single touch start mechanism allows it to be turned on and operated with ease. Let’s begin our WEN 6-ton log splitter reviews by speaking about the WEN’s construction quality and design. Made out of heavy-duty steel, this splitter is equipped to withstand loads of wear and tear, whether it be situated in a garage, shed, workshop, or heavily wooded area. Designed with large, graspable, ergonomic handles as well as a set of two wheels, this splitter can be easily transported from location to location. It weighs in at 100 pounds; a fairly standard weight for a log splitter of its size. Measuring in at 18 inches x 11.5 inches x 37.5 inches, it’s reasonably compact and capable of being stored in the majority of workshops or sheds with ease. Equipped with two side rails, this splitter is designed to hold logs firmly in place during the splitting process. Not only does this help to make it safe, it also serves to make your job a great deal easier. Electric log splitter vs gas: which one is easier to use? Well, when it comes to the WEN, there are several different components to that answer. First, let’s talk about how easy both are to operate. The electric splitter can not only be turned on easier than the gas splitter, but can be operated easier after it’s been turned on. That’s because it possesses a one-touch starting mechanism which eliminates any struggle you might have when trying to start a gas splitter. Now, when it comes to overall portability, the gas splitter wins. Because the electric splitter must be plugged into an outlet during use, it can only be used in locations that are in close proximity to an outlet. Gas splitters can be taken just about anywhere. For its price, you’re not going to find an electric splitter that’s as easy to use as this one. It does many of the same things that standard-priced splitters can do, but at just a fraction of that price. A corded, electric log splitter, the WEN offers up to 6 tons of splitting force. This is enough to handle both small and medium sized logs regardless of what type of wood they’re made out of. With a 2 horsepower motor, it offers standard power for a splitter of its size. For its price, it offers excellent power capabilities. Despite the fact that it’s about half the price of many 6-ton splitters, it still offers the same overall force. In essence, you’re not going to find anything more powerful for the money; not by a long shot. As far as its splitting quality goes, the WEN is fairly standard for a 6 ton splitter. Made with WEN log splitter parts, including its splitting ram and surface, it can successfully split logs up to 10 inches in diameter and 20.5 inches in length. However, it should be noted that it doesn’t split logs of this size consistently. The biggest logs that it can consistently split are around 5 inches in diameter and 10 inches in length. Anything bigger, and it’s going to struggle a bit. But for its price, this is about as good as you can expect. There isn’t a log splitter on this planet that isn’t at least a little noisy. This WEN splitter is certainly no exception to that rule. However, compared to many splitters, the WEN makes relatively little noise. It can most accurately be compared to an outdoor air conditioner compressor. Sure, it’s not easy to have conversations while it’s running, but it’s not so loud that it’s going to scare the neighbors either. For its price, you can’t ask for more. 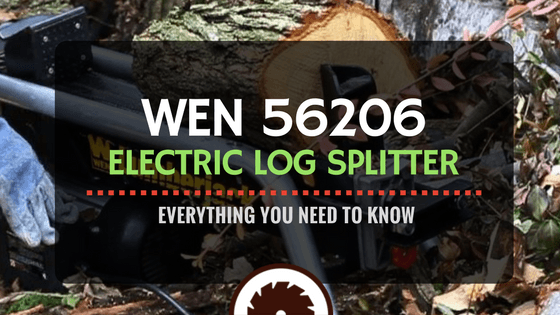 For the last part of our WEN 6-ton electric log splitter reviews, we’ll compare the WEN to other similar log splitters. Let’s start by comparing the WEN to the Boss Electric Log Splitter. We might as well get this out of the way quickly: the Boss is a far superior splitter to the WEN. It splits more consistently, is equally portable, and possesses overall better construction quality. Next, we’ll compare the WEN to the Goplus 6-ton log splitter. These two splitters are very similar, possessing similar construction, power capabilities, cutting ability, and price points. Both splitters are capable of 6 tons of splitting power, splitting small sized wood consistently, and splitting medium sized wood reasonably well. Both are also equipped with a handle and two wheels, making them very easy to move from place to place. The truth of the matter is that neither one of these splitters is really better than the other. If you’re trying to decide between the two, we recommend picking the one that is cheapest. The last log splitter we’ll compare with the WEN is the Powerhouse XM-380. Both splitters possess around the same amount of power, with the Powerhouse being a 7-ton and the WEN being a 6-ton. They’re also both very portable as they are equipped with wheels and handles for easy transport. Where the real difference shows up is in their price. The Powerhouse is almost twice the price of the WEN. While it does provide a little more power, it’s nothing too remarkable. Unless you’re really interested in that extra little bit of splitting force, you should spend less money and go with the WEN.